Smokinsumsweet’s weight related health problems are now a thing of the past as she works towards attaining her goal weight. 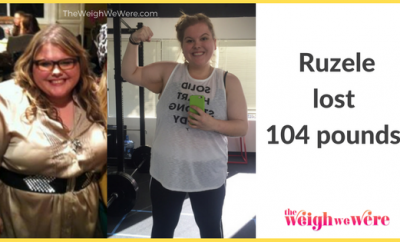 Being more nutrition conscious, watching food portions, exercising, and keeping herself motivated have helped her lose 106lbs. I was only 21 or 22 years old and continually throwing my back out. I knew it was because of my weight but I had become so sedentary and comfortable with my lifestyle. Finally a major life change caused me to feel “out of control” and I decided to take over the one thing that I did have ultimate control over – my future. And a big part of my future was my health. Honestly, I don’t think I ever really tried. If I had, I would have lost weight and kept it off. I was complacent and made excuses for myself as to why things didn’t work. I started out by eliminating fast food and restaurants and going to the gym in the morning before work. I didn’t get a lot done, looking back on it. But it made a huge difference. Being at the weight I was, even small effort burned tremendous calories (and consumed tremendous energy on my part). Mostly I walked at an incline and did lower back exercises. I was really good about going, at least 5 days a week, for the first 10 months. At first I didn’t count calories but once I got into logging my food I was able to really identify my problem areas and I maintained an even 1300 on weekdays, up to 2000 on weekends. By October of 2010 I was down to 180 lbs. WOW. Since then I have seen major changes in my body as I continue to exercise and focus on eating healthy. The last 20 lbs really are the hardest, but I feel so good about what I have done that I feel like I won already! I used to dread exercise. The way my chest ached when I did cardio… but I did it. And I kept doing it. And now my chest doesn’t ache anymore. I love working up a good sweat. I go to the gym before work most mornings, and often find myself going back in the afternoon because I didn’t have time to do everything I wanted. I knew girls that seemed to be attractive and fit and happy without trying. Now I know that they did try; they just didn’t MIND trying. I have not always been an active poster in the Forums and Blogs but reading other peoples stories (their successes as well as their downfalls) have helped me so much. 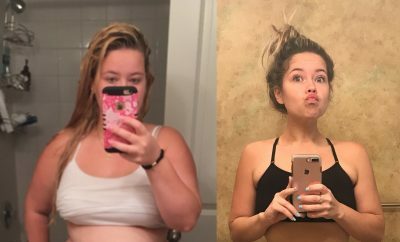 The food log was CRITICAL for me the first 6 months, and everyone was so supportive. Getting going was the hardest thing I ever did. Stepping foot on a treadmill at almost 300lbs was… embarrassing. I couldn’t fit on some of the gym equipment that I wanted to use. But I was amazed at how fast the weight fell off of me once I made even small efforts. Thinking about how fast my life has changed… almost makes me emotional. I never thought I could do it. I lost about 50 lbs before I could buy a smaller size in jeans. After that, my sizes changed rapidly. I saw the numbers go down on the scale every week but it really didn’t hit me that I was DOING it until I was able to buy smaller pants. I got rid of my fat clothes. I don’t need a reminder – I have loose skin and stretch marks for that. As soon as I under-grow a size I donate my clothing that is too large for me. If I gain a couple pounds and my pants are fitting snug I wear them – uncomfortably – to remind myself that I don’t need whatever enticing food item I am dreaming of. Those tight jeans encourage me to go sweat it out for an hour. I was lonely, bored, and painfully shy. I had no self esteem. I didn’t like going out in public and didn’t want to meet new people. I was ashamed. I thought I would be alone forever. Now I go out to clubs every week, meet tons of new people, work doing promotions and I MODEL part time. NEVER IN MY LIFE did I see myself modeling. EVER! I still can’t believe it. I have been hanging around 180 lbs for over a year now. I would like to lose another 20 I have been focused more on building back that muscle I lost in the beginning. I feel more toned and tight, and wear a smaller size now then I did a year and a half ago at the same weight. Be real with yourself. We get to be overweight by being unrealistic about what we are consuming, how much we really need, and how much we really exert. There is never a need to eat anything that’s a foot long. If you sit at a desk most of the day and go for a short walk after dinner, that’s not living an active lifestyle. I think the first step to managing weight is determining how much food we really need for our lifestyle and stop making excuses for ourselves. 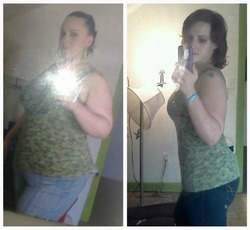 Take pictures as you lose weight to mark your progress, but get rid of the fat clothes. IF your clothes ever start to pinch a little, you have NO CHOICE but to lose a couple pounds, unless you want to shell out the cash for a new wardrobe. TURN OFF THE TV! Get busier. Do stuff. Even if it’s not “active” stuff. After work I used to go home and mostly just relax, watch TV, and EAT. Friends might come over, but we basically stayed in. After work now I go to the gym and usually try to bring a friend. After we might go for a ride around or take a walk through a department store just to check stuff out. By the time I get home and shower, it’s already close to 7pm. If a friend doesn’t come with me I may play with the dog when I get home, catch up on my laundry, and generally do all the chores that I used to save for the weekend. I barely have time to eat dinner and get to bed before I awake at 4:30am for my morning cardio. I never turn down an opportunity to leave my house and go do something, even if it’s just going with a friend somewhere or running errands or an extra gym session. I watch TV only right before bed. Retrain your friends. I found that as I began to really lose weight a lot of my friends would always ask me to come to dinners, try a piece of this or that, or do other things that they and I both knew were not going to help me reach my goal. It was hard to say “NO, I don’t want to try your amazing smelling brownies.” Eventually I had to really sit down with my closest friends and explain to them that although food has been a social thing for me in the past it’s a real problem for me that I NEED their help. I explained that I will not change as a person, I will always be their friends, and we just need to find different things to do together. Instead of going out to dinner as a social thing we might go out dancing now. Its way more fun, and physically good for all of us! Use the food log and be honest. You are only cheating yourself if you don’t put in EVERYTHING! No one see’s it but you – I KNOW the truth is HARD to see sometimes!! How could I have eaten 2000 calories today and be hungry?? (Fast food??!!) The food log really helped me identify foods that filled me up, kept me satisfied, and stayed within my calorie range. 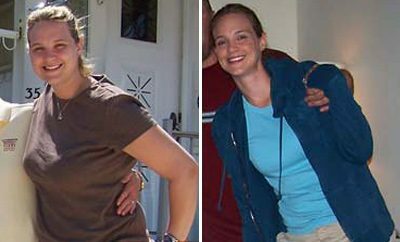 ← Previous Story Weight Loss Success Stories: Eleanora Lost 57 Pounds And Went Down 11 Sizes!